This issue of Monthly Review marks the sixtieth anniversary of the magazine. We are reprinting here Albert Einstein’s classic article “Why Socialism?,” written for volume 1, no. 1, of Monthly Review (May 1949). On Thursday, September 17, we will meet together at the Ethical Culture Society in Manhattan to celebrate and to promote a global socialism for the twenty-first century. We invite all our subscribers and friends. 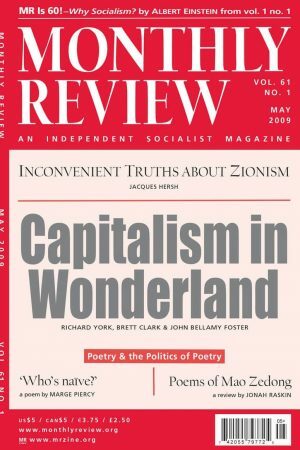 Looking back over the history of Monthly Review we are struck by the historical congruence between the long-term critique of capitalism developed in these pages over the decades and the actual course of events. This is true with respect to all three major areas of crisis of the capitalist world system: economy, ecology, and empire. With respect to the economy, the work of longtime MR editors Paul Sweezy and Harry Magdoff began to focus on the creation of the dollar standard while it was coming into being at the start of the 1970s (with the demise of the old dollar-gold standard). From that time forward they identified the U.S. external balance of payments deficit with U.S. external military expenditures. The power of Washington to enforce the dollar standard allowed the United States to engage in massive imperial spending, flooding the world with dollars without the United States itself having to bear the consequences. Similarly the growth of U.S. debt as a proportion of GDP was commented on from the early 1960s. In the 1970s this came to be identified as a marked trend extending beyond mere business cycle ups and downs. This was manifested, most spectacularly, in an explosive growth of the U.S. financial sector in relation to the underlying real economy. In the last two decades of the twentieth century Paul and Harry began to see the most visible economic phenomena of the day—notably financialization, “globalization,” and the creation of a global reserve army (and excess productive capacity)—as manifestations of or attempts to offset the fundamental stagnation tendency first identified in the 1930s. Stagnation and financialization, they suggested, increasingly took the form of a “symbiotic embrace,” with the root problem in the former. As the twentieth century drew to a close, it seemed clear to them that financialization was not only failing to offset the slowdown of growth, but was itself tending towards what looked increasingly like a limit, with the hypertrophy of finance likely to lead to more and more devastating financial crises. Among Harry’s favorite images in his last years was that it took dramatically larger and larger amounts of new debt to achieve the same degree of growth in the U.S. economy. Paul in his last years observed that he was comfortable with death, but regretted not getting to see how it all turned out. He would not have been surprised by what has, in fact, happened. MR’s editors were sure they had identified some basic explanatory relationships that were not apparent on the face of things. But they did not pretend (in line with the inflated pretensions that too often characterize intellectuals, on the left as well as the right) to have developed what amounted to a new system or model that covered most everything of importance. Rather Paul, in particular, insisted that the full analysis of these marked and interconnected processes in global capitalism—financialization, stagnant growth, concentration of key industry into a relative handful of multinational corporations, the shift in power from boardrooms to bankers—would have to be taken up by younger thinkers who would have the benefit of seeing these historical contradictions work themselves out. In these pages, we have applied this intellectual legacy to events as they developed in the U.S. and global economies over the last several years. We think that any fair-minded observer would agree that this outlook has given us—and we trust our readers—a powerful tool to understand events as they have developed. Yet, in our view, this legacy was never to be viewed as the endpoint in the construction of a system. Rather it was a starting point—requiring for its completion continuing historical analysis, actions, and critique—in a collective attempt to change the world. If we often refer back to the MR tradition, it is in order to give credit where it is due, and more effectively to push the project of radical social transformation forward. Needless to say, the economic analysis of monopoly capital (or as it now appears monopoly-finance capital) is at the core, but not the whole of the MR project. Monthly Review is also known globally for its critique of empire and, more recently, for its ecological critique. Unfortunately, space does not allow us to examine these other vital threads here. All three of these core problems are increasingly interrelated in today’s historical moment, reflecting what can be seen as a total crisis of the system. Moreover, these contradictions of the capitalist system are all deeply rooted in the manifold forms of oppression associated with class, nation, race, gender, sexual orientation, nature-exploitation, and other fundamental divisions. Exactly how all of these various forms of oppression fit together, we do not hesitate to admit, is not altogether clear to us, and has been the occasion of much disagreement on the left. But the reality that they do overlap, that this is related to the system, and that the way out lies in finding a common ground of resistance is not to be doubted. As always, MR is committed to the forging of this common ground for revolutionary change. 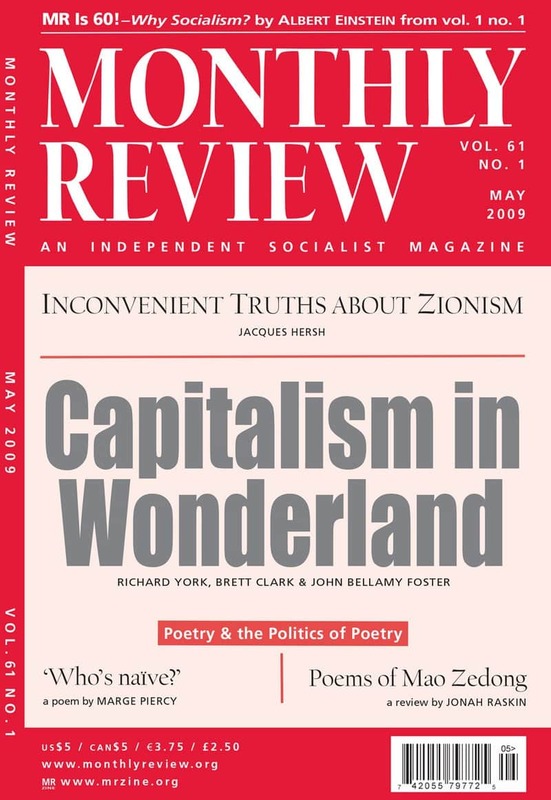 Although MR’s editors have invariably identified themselves as Marxists, the magazine has sought to be a place where other radical currents were also welcome: the one condition being a rock-bottom critique of the capitalist system from the standpoint of humanity (and the planet) as a whole. This broad, non-sectarian outlook has also characterized Monthly Review Press, and more recently MRzine. We are eager to meet with those of you who can join us for our sixtieth anniversary celebration and public meeting in September (information to be provided). But we also would like to take this occasion to invite the vast majority of you here and around the world who will not be able to gather together with us in New York on this occasion, to join with us nonetheless in the critical struggles ahead. “Clarity about the aim and problems of socialism,” Einstein wrote sixty years ago in the pages of Monthly Review, “is of greatest significance in our age of transition. I consider the foundation of this magazine to be an important public service.” We believe that his words, and the role that they conferred on Monthly Review in particular, are even more important today, six decades later, than when they were first written. These notes commemorating the sixtieth anniversary of Monthly Review would not be complete without also commemorating one of our oldest and most cherished subscribers, our friend Pete Seeger, now celebrating his ninetieth birthday. We are happy and proud to identify MR with all of the things that Pete has stood for in his life. May his banjo play forever!